The lights were dimmed, everyone was wearing suits and dresses, and the DJ was playing music for the crowd. But this wasn’t your typical prom. In fact, it was a commercial shoot for the Connectable campaign. 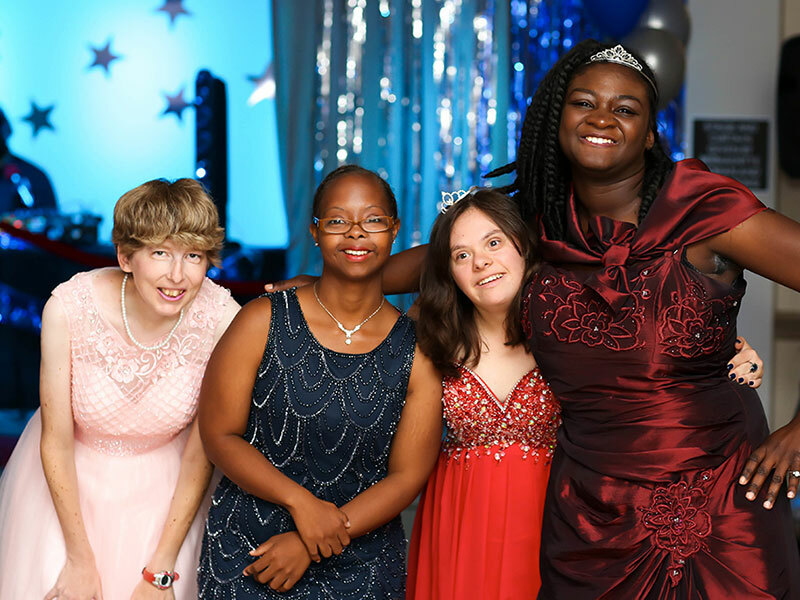 The advertisement being filmed, titled “The Dance,” tells the story of a teenage volunteer making an unexpected connection with a girl who has Down syndrome at a unified dance for people with IDDs and typical people. You can see the full advertisement here, but what went on behind the scenes? The community center was transformed into a prom night with streamers, sparkling lights and the prerequisite punch bowl. Village residents and friends in the IDD community came together to serve as the lead roles and extras. The actors danced for nearly three hours as the advertisement was filmed. Despite some sore feet, everyone had a lot of fun and finished the dance with some much-deserved snacks and punch. What was especially exciting about the filming was the connections made between typical extras and people with IDDs. Like in the advertisement, everyone started dancing together and found new connections with each other. To see another Connectable advertisement about James, a real office worker with an IDD, click here.